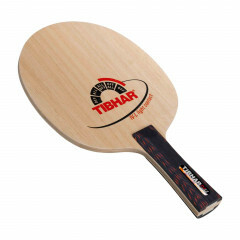 The TIBHAR Allround classic presents itself as an ALL/OFF blade due to the applied "contact grip system". It is lighter, although it has a bigger racket shape. The grip system shifts the centre of gravity and makes this blade fast and more controllable. You will enjoy playing with this blade if you are looking for the combination of a secured allround play and powerful topspins. Tibhar Blade 4-L Light Contact is beeing added to cart.